cryptonaut-in-exile: #TenYearsLater We don't yet grok the need for a proper mosh pit. 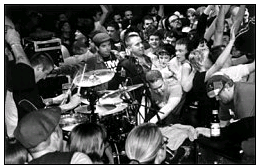 #TenYearsLater We don't yet grok the need for a proper mosh pit. No less so now, than a decade ago, I encourage folks to read my man Mark's "WRECKTHEPLACEFANTASTIC: A Metaphysics of the Mosh Pit". Every Yo La Tengo show should have one!